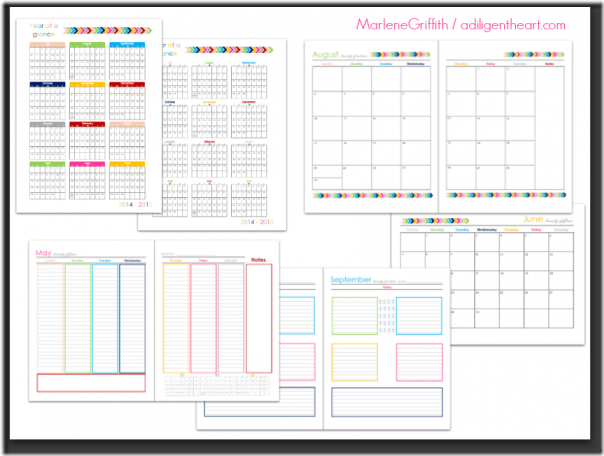 What are you using for a calendar or planner right now? Are you happy with it? You don’t have to wait till January 2015 to get a new planner/calendar if you aren’t happy with your current system or worse, you don’t have one yet. Marlene from A Diligent Heart has created a July 2014-Jun 2015 digital planner and I want to share what it’s like with you. The full version includes 2 year at a glance options, one-page month at a glance, two-page month at a glance, two-page week at a glance and daily pages for only $10.00. There are also one-month and two-month kits for only $7 that include either the one-page month view or the two-page month view but not both. For any of the kits, you can choose a Sunday or Monday week start. The 2014-2015 planner is made in full colour although you can always choose to print in black and white through your printer if you so choose. It is designed to be printed double sided and she also gives permission for you to have it professionally printed and bound as long as it’s for personal use. The pages are pretty simple in their design and because there are different versions, you can pick the one that works the best for you. If you need to write a lot down for each day, you can use the daily pages which have 5 separate boxes so you can keep separate lists for separate parts of your life. There is also a place to track water if that interests you. If you don’t need that much room, the two-page week at a glance still offers quite a lot of room to write each day with the benefit of being able to see a few days before and after the current day too. The year at a glance pages are good for quickly seeing what day of the week a certain number day is on.